Contemporary convertible sofas feature stylish and trendy designs while not compromising at the comfort factor and their functionality. They provide you practical solutions as your convenient seating and sleeping spaces. A convertible sofa can be easily converted in to a lounger or bed. You can use it as a sofa by day, lounger in the evening and a bed at night. It is available in a wide spectrum of colors and in various upholstery fabrics including linen, leatherette, microfiber, microsuede or chenille. Bring home the graceful Swan Hill Convertible Sleeper Sofa and enjoy luxurious comfort with style. This gorgeous sofa features a robust wooden frame that ensures durability and reliability for many years. 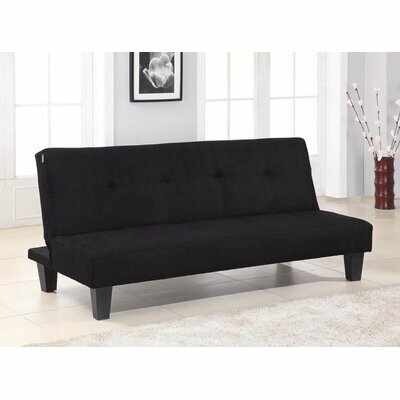 It is thickly cushioned with foam, upholstered in bold black colored fabric and tufted for a chic and stylish look. This convertible sofa is adjustable to three different comfortable positions including sitting, lounging and sleeping. Swan Hill Convertible Sleeper Sofa Collection. Versatile sofa converts to a lounger and a bed. Built out of robust and sturdy wood. Has seating capacity for three. Available in more fabric colors including Black Vinyl and Red. Mattress is 7.5 inches thick. The sleeper sofa features folding mechanism. Generously filled with foam and synthetic fiber. Back seat cushion is tufted. This convertible sofa does not require assembly. Product Care: Clean with a dry cloth. Avoid using strong liquid cleaners. The stylish Serta Dream Thomas Sleeper Sofa by LifeStyle Solutions will adorn your living room with its classy look. 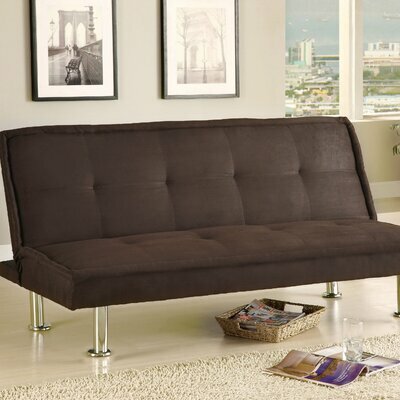 This lovely Sleeper sofa is a comfortable seating solution by day and a cozy dream sleeper by night. It features individually encased coils that are topped with quilted memory foam to ensure ultimate comfort. Durable and sturdy wood construction. Also available in Light Brown colored upholstery. Reclines at three different levels to convert from a sofa to a lounger and bed. Storage compartment beneath the sofa cushions for storing throw pillows, bed linens and pillow covers. Rolled arms are wide, plush and thickly padded. One year limited warranty on replacement of parts and craftsmanship. Product Care: Spot clean or use a damp cloth to clean it. With its simple yet elegant look, the modern Keshawn Modular Sectional will add a stylish touch to any living room décor. The Keshawn Modular Sectional is a versatile furniture that is designed smartly with maximum comfort and practicality in mind. It comes with a storage space under the seats for store practically anything from less used items to bed linens or extra toss pillows. For your overnight guests, double this gorgeous contemporary sectional to convert it in to a comfortable bed. Its European style, premium PU leather upholstery in black and detailed stitching will create a fresh and upgraded look for your living room. Easily convert to a bed. Bed size is a little smaller that a full size bed. Made from sturdy tropical wood. Upholstered in PU leather that is made from 100% polyester. This sofa is also available in White colored upholstery. Includes one chaise and one loveseat. Allows you to place Chaise on either side of the loveseat. Both the loveseat and chaise seats open to reveal a hidden storage compartment. Sectional easily transforms into bed within seconds. Bed size is a little smaller than the full size bed. Square shaped armrests are interchangeable. Maximum weight limit is 660 lbs. The elegant and classy the Battles Sleeper Sofa will add a touch of sophisticated style to your living room. With its highly durable wooden frame, this sofa is sure last long. The cotton upholstery is soft and easy to clean. It sports a pleasing to eye tan color in solid print that adds visual appeal to its overall look. 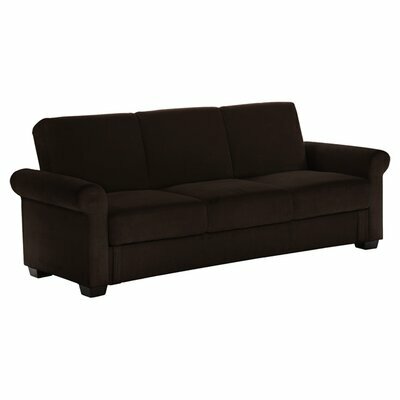 This convertible sofa can be easily converted in to a comfortable sleeper for your overnight guests. It is a practical choice as it comes with a hidden storage space below the seat cushions. This convertible sofa is eco-friendly with minimal impact on the environment. Converts easily to a full size bed. Frame is crafted from sturdy and durable wood. Frame features dark brown finish. The upholstery material is cotton. Storage space beneath the seat cushion. Includes a mattress that has spring coils, pillow top foam with medium firmness. Legs are made of plastic. Requires minimal assembly. Only legs and arms need to be attached. Create a stunning focal point in your living room with the chic and classy look of Aristo Convertible Sofa by Hokku Designs. The back seat of this elegant convertible sofa reclines back to convert it into an immensely comfortable bed. The seat and back cushions are very thickly padded with foam and are extra fluffy to ensure luxurious comfort. 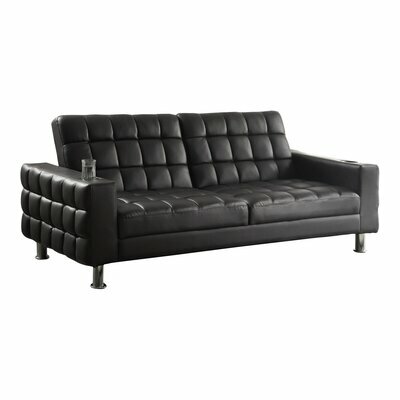 Dark espresso colored faux leather upholstery, tufted design and solid pattern add to its visual appeal. Accented with stylish and tastefully designed chrome legs, this gorgeous convertible sofa will be a welcome addition to your living room. Sofa frame is made from durable wood that will last long. Reclines to convert in to a full size comfy bed. Also available in pleasing to eye Reddish Brown colored upholstery. Tufted cushions for a chic look and crisp shape. Generously padded cushioning for immense comfort. Stylish and unique chrome finished legs support the sofa. Two extra hidden legs for additional support and solid foundation. Quite easy to assemble with the help of a crossed screwdriver. Manufacturer provides 30 days limited product warranty. A practical fusion of comfort and functionality, this convertible sofa by Hokku Designs will prove to be a smart choice. The chic and contemporary style of this sofa is will add style to your living room décor. With its nicely scaled silhouette, it fits perfectly in both large and small living rooms. Just recline its back to make it a comfortable bed and sleep comfortably on its cozy cushioned seats. Converts into a comfortable bed when reclines back. Also available in Tan colored upholstery. Extra foam padding for additional comfort. Welt on cushions for a clean and crisp look. Back and seat cushions are tufted. Rests on four stylish chrome finished legs. Includes an extra hidden metal leg to ensure additional stability. 30 days limited product warranty provided by the manufacturer. The timeless design and appealing look of the Beyan Linden Sleeper Sofa will glamorize your living room décor. The frame of the sofa is constructed from sturdy metal for long lasting durability. The striking maroon colored fabric is soft to touch and looks chic. The Linden Sleeper Sofa converts in to a comfortable bed quickly with least physical effort. This versatile sofa also has a hidden storage compartment under the seat cushion. 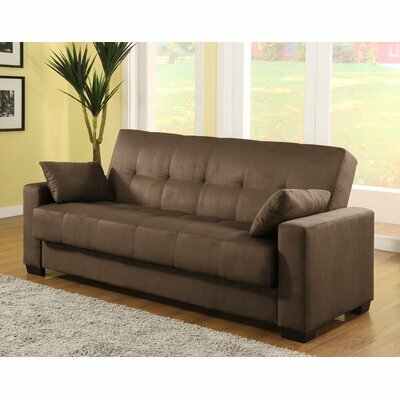 Accented with two toss pillows, this stylish and comfortable convertible sofa is a must have. Converts in to a bed easily and quickly. Under seat storage compartment for keeping bed linens, throw pillows and covers. Plastic legs in dark brown color. One extra leg in the middle for additional support and stability. With the aesthetically appealing Napa Convertible Sofa by LifeStyle Solutions there is much more than what just meets the eye. It has hardwood frame that renders strength and durability to the sofa that will last to witness many years. Sturdy wooden legs support and balance the sofa to keep it steady. This lovely sofa is lusciously cushioned with high elasticity foam and upholstered in soft microsuede fabric for ultimate relaxing and comfortable seating experience. The Napa Convertible Sofa has a click clack mechanism for locking this convertible sofa into three different comfortable positions including sofa, lounger and a bed. A hidden storage unit below the seat cushion makes it easy for you to stash your less used items there and keep your room organized and clutter free. With seating capacity for 3. 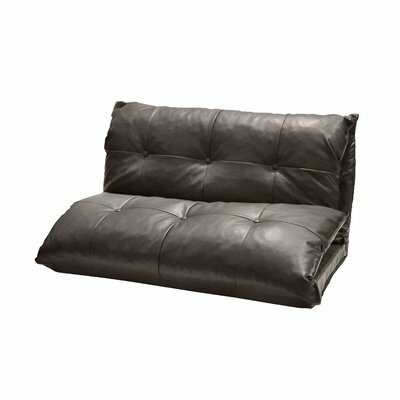 Reclines and locks in to three different positions, sofa, lounger and a bed. Unfolds in to a full size bed. Storage space beneath the seat cushions. Soft to touch and easy to clean microsuede upholstery. Also available in lovely Java finished fabric color. Assembly is required and very easy to assemble with an Allen key. LifeStyle Solutions provide one year warranty for replacements of parts and craftsmanship. The simple and practical Urban Shop Tufted Faux Leather Flip Sofa by Idea Nuova is ideal for small spaces. If you live in a small apartment or a dorm room and you want a comfortable sofa that can fit into a small area without occupying much of the precious space then this Urban Shop flip sofa is what exactly you need. By day time you can use it as a lounge chair. At night you can convert it in to a bed with pillow just by flipping it. 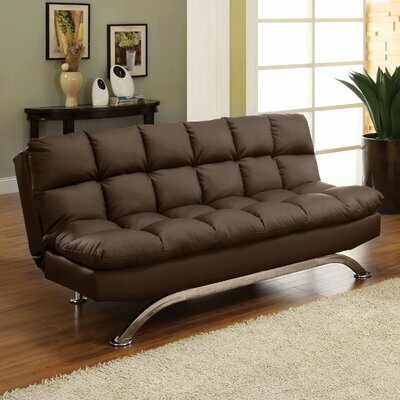 It features a stylish button tufted design and neutral color that match with a wide range of room decors. It unfolds easily and quickly from a lounge chair to a comfy bed. Ideal for small room such as apartments and dorms. Upholstered in easy to maintain faux leather upholstery. Also available in Brown color. Saves you the trouble of putting it together as assembly is not required. Maximum weight capacity is 225 lbs. Product Care: Only spot clean this sofa. Add a chic and classy touch to your living room with this contemporary style Wildon Home ® Convertible Sofa. 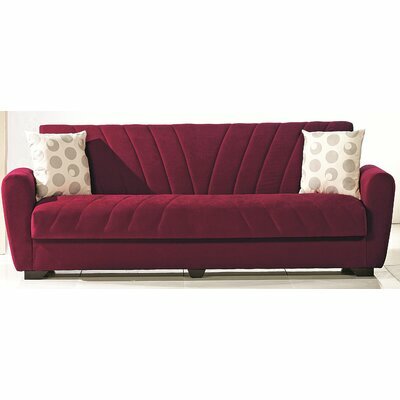 With its lusciously foam-padded cushions, this convertible sofa is an easy and practical solution to your all seating and sleeping space problems. The dark brown quilted arms, seat and back cushions in faux-leather upholstery with modern chrome finished legs create a fascinating visual appeal. Both arms feature a cup holder where you can put your cup of steaming hot coffee while enjoying a great novel at night or watching a movie with your family or friends. Reclines back fully to transform into a bed. One cup holder on each arm. Faux leather upholstery is durable and easy to clean. Thick padding for ultimate relaxing and comfy seating. Seat cushion, back cushion and outside panels of the arms are beautifully tufted.